When Victoria was eight years old her father swept her up in a fantasy: a trip around the world. It was a grandiose plan and she had fallen for it. But it had never been so much as a possibility. Victoria’s father was sick. He was HIV positive and soon to fall prey to AIDS. Three years later he would be gone. When Victoria realized that the grand trip with her father wasn’t going to happen, she was devastated. Her mother assumed she’d get over it, that eventually it would become just a shrug. But it didn’t. In the years to come, Victoria wondered what it would have been like to have been alone with her dad all those months, to see him outside of his sickness, beyond anything related to their family or their life. To have been with him in a new context. That’s what she wanted. And that’s what she did. 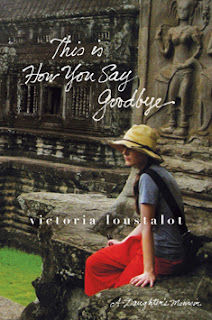 Some fifteen years after that initial promise, Victoria went to Stockholm, to Angor Wat, and to Paris. She went to the places they were meant to see together, and she went to make peace with her father, too. Because while he’d always be forty-four, she’d gone on accumulating birthdays. Every year, her understanding of him continued to evolve and their relationship was still alive. Victoria Loustalot felt trapped beneath all of the unanswered questions he left behind. She needed to be set free. She needed to say goodbye. Add your review of "This Is How You Say Goodbye" in comments!